You know what they say: location, location, location! 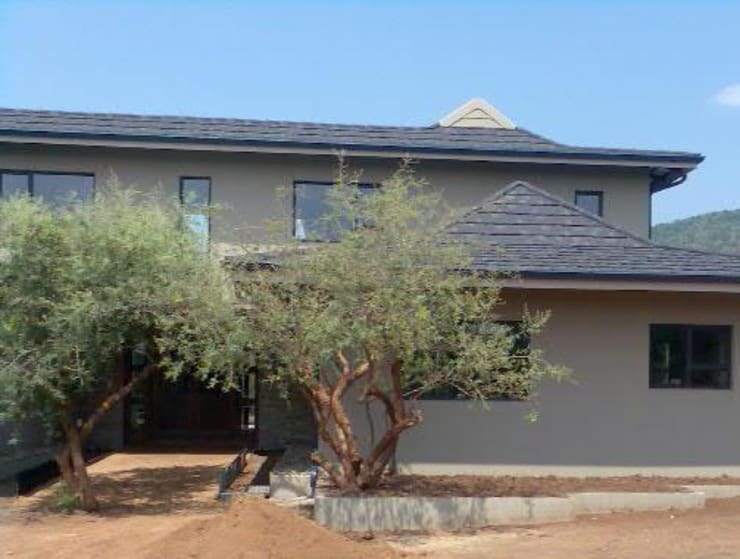 Well, the importance of choosing the setting for one’s house is firmly reminded to us with today’s homify 360° discovery: a modern home, situated in Barberton, Mpumalanga with a lush bushveld as its back yard. Not too shabby, eh? Designed in an H-shaped plan, the house is organised around a central courtyard (which becomes the prime spot for socialising and entertaining, as you will soon see). But regardless of where in the house you are located (on a top-floor balcony or on a bottom-level terrace), that amazing landscape view still finds you. The costs of this house? A cool R2 million. At first glance, it would seem that the house just grew out of the ground right amongst existing trees and shrubs. But no, the added trees are just for visual effect, neatly framing the front entrance. As for the house itself, its modern façade flaunts a neat and subtle complexion of strong neutral hues, forming a strong juxtaposition with the rich greens and blues of the surrounding background. The client’s requirement for the house was a modern structure which possesses a certain degree of symmetry. 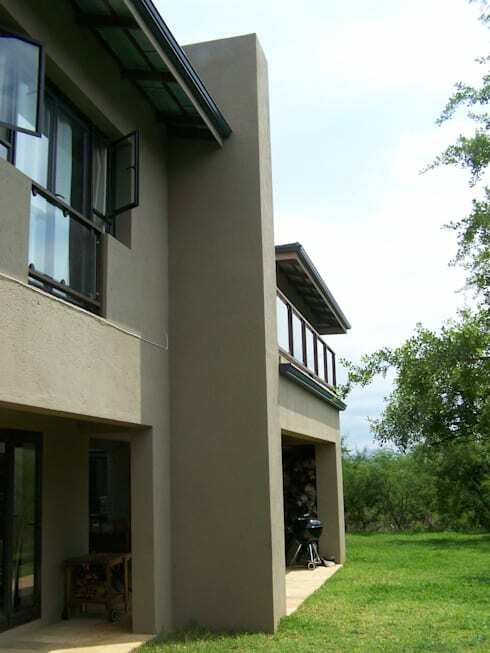 The final relaxed shape of the roof was to make the house fit in more comfortably with the rich natural surroundings of the wildlife estate, where wild game is allowed to roam freely between houses within the fenced estate. Well, this certainly explains the need for high balconies in case a lion or hippopotamus decides to come take a closer look at the house! 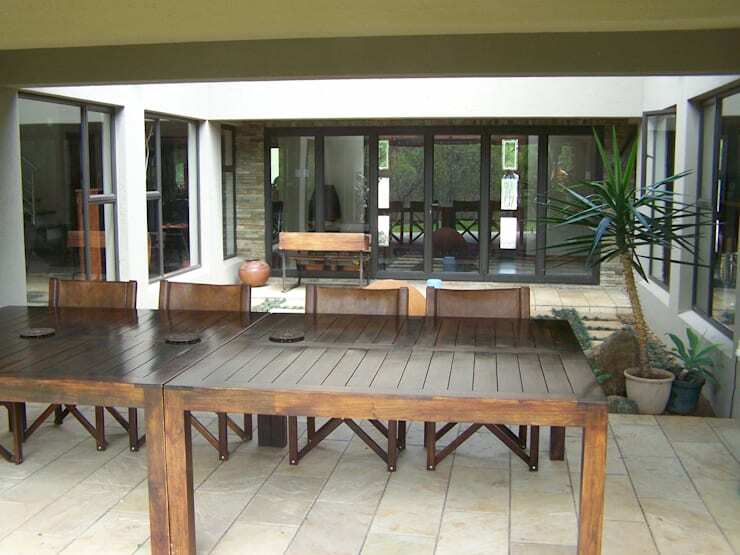 The bottom terrace presents ample space, which is why an exterior dining area was a necessity. 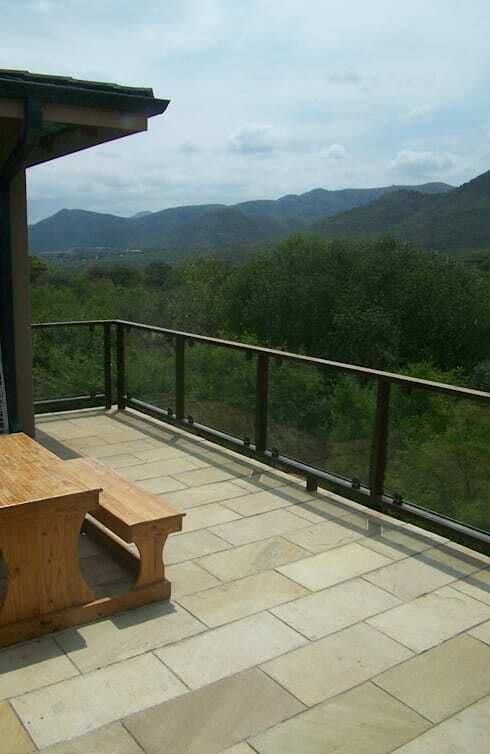 How else does one enjoy breakfast (and lunch and dinner) with a bushveld view? Here we get a look at the wooden dining table and –chairs coated in a rich brown hue, contrasting most effectively with the lighter tones of the stone-tiled floor. As we can see in the background, numerous glass panes are part of the structure, forming windows and glass doors which allow plenty of natural light (and landscape views) to seep indoors. 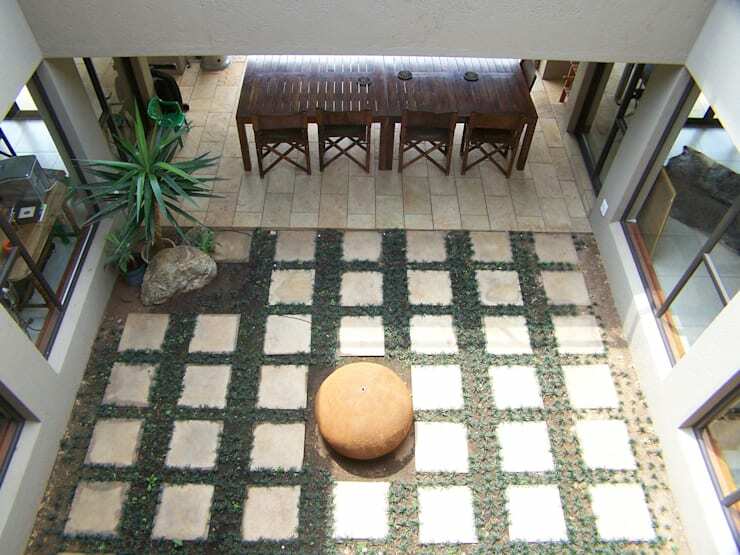 Right behind the exterior dining zone is the central courtyard, dressed up to the nines via stepping stones, lush garden touches, and a central water fountain in a spherical shape. We close off our quick tour with a look at the main reason for this house’s location: the magnificent view, as seen from one of the top-floor balconies. This area also presents ample space for furniture, as we can see by the wooden picnic bench on the left, conjuring up another superb outdoor area to enjoy a meal, drinks and the fresh air – not to mention check out a wild animal from a safe distance! For another local stunner, have a look at: 7 photos of a beautiful Johannesburg home you have to see. Our comments section is just for you – so tell us what you think of this house and its fantastic setting.